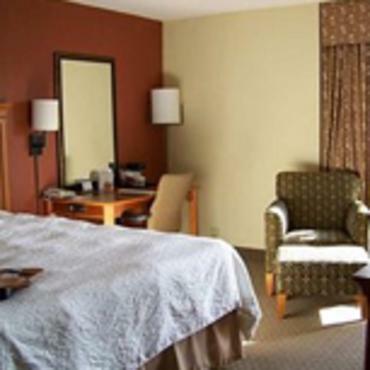 Here at the Hampton Inn Norfolk Naval Base Hotel, you'll receive service consistent with our Hilton Brand excellence. Whether you're here for business or pleasure, the Hampton Inn Norfolk Naval Base has what you're looking for. Visiting Naval Station Norfolk, the largest Navy Base on the east coast, no problem; we are less than 1/2 mile and would be happy to provide you with accurate directions. Perhaps attending an event at Old Dominion University or the Ted Constant Convocation Center, perfect; we're just 3 miles from campus. Even if you are just looking to spend some time visiting the sites, we are 7 miles from Downtown Norfolk. With free parking and complimentary hot breakfast, the Hampton Inn Norfolk Naval Base will provide you with a level of service that can match your wallet and your comfort. In fact, we guarantee your satisfaction or we don't expect you to pay. That's the Hampton 100% satisfaction Guarantee.